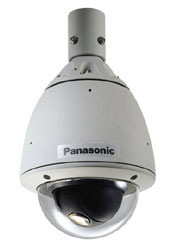 Panasonic combines a vandal resistant outdoor housing with 22x optical zoom capability (220X with digital) and high resolution. This all-in-one day/night (color/mono switch-over) dome camera is ideal for outdoor applications such as outdoor parking lots, retail sites, parks, hotels, and office buildings. It's rugged body meets international IP66 standards for dust and moisture resistance, and can be easily installed under eaves or exterior walls.This ultra sensitive camera produces clear color images in lighting as low as 0.5 lx(0.05 fc) or black-and-white images at 0.03 lx(0.003 fc) (both with sensitivity 2x up,AGC high). The WV-CW864 also comes equipped with digital flip capabilities for ease of tracking. Privacy zone masking protects against operator misuse and the general publics rights to privacy. Patrol learn functions and motion detection are only two of 64 pre-set operations, raising surveillance to an unprecedented level. Horizontal resolution is 480 in color and 570 in black & white mode. It has an auto focus lens, alarm inputs/outputs, and an automatic heater for optimal performance in low temperatures.